Why Should I Use Music in My Classroom? "We know an age more vividly through its music than through its historians." I have never met anyone whose life has not been influenced by music in some way. 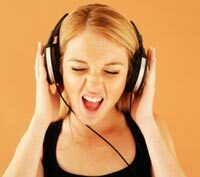 Music sets the stage for our lives; it has the ability to trigger memories and manipulate moods. Music can stimulate our creativity and increase the connections in our neural network. If for some reason you have never heard of School House Rock or if you just want to take a trip down memory lane, here is a video for your viewing pleasure. The Rock and Roll Hall of Fame - currently houses 52 lesson plans using rock and roll to teach History, English Language and Literature, Economics,Social Science, Psychology, and Government. Science in School - "Using music in the science classroom" by Caroline Molyneux - extremely interesting article from science teacher Caroline Molyneux outlining her strategy of using music in her classroom to begin class and to facilitate memory retention in her students. Flocabulary - Educational Hip-Hop - subscription resource with videos covering English (both literature and vocabulary), math, science, social studies, and current events. Individual teacher rate is $5-7/month (depending on whether or not you want the current event videos each week) or $63/year (get 3 months free). They also offer free videos on their site and on YouTube as well, including this one for Macbeth that I used with my sophomores. 4. "Interactive Music Strategies for the Academic Curriculum" by Michelle Lazar - Practical ideas for integrating music into the curriculum.